Razor sharp Rick Hinderer 3" Model XM-18 Harpoon flipper folding knife in textured black G-10. Lanyard hole in the handle. Dual thumb studs and a flipper for easy right or left hand operation. Flipper serves as an index finger guard in the open position. Filed thumb rest on the handle and blade spine for a secure grip. 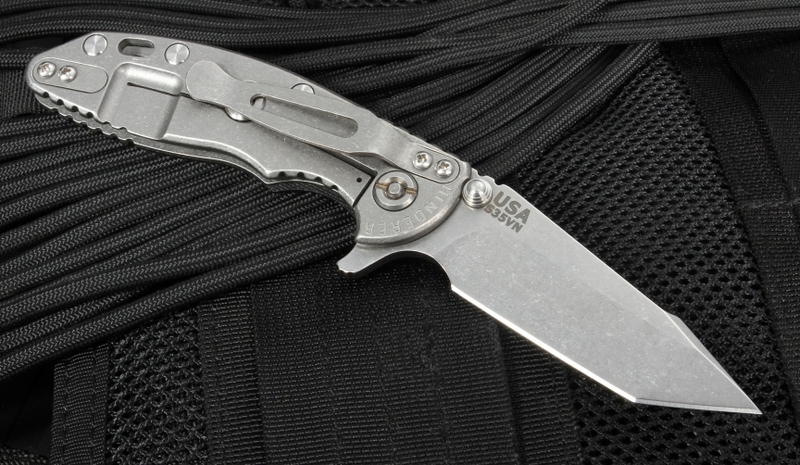 Stone washed titanium pocket clip can be mounted blade tip up or tip down. Solid frame lock design. Smooth opening and closing. 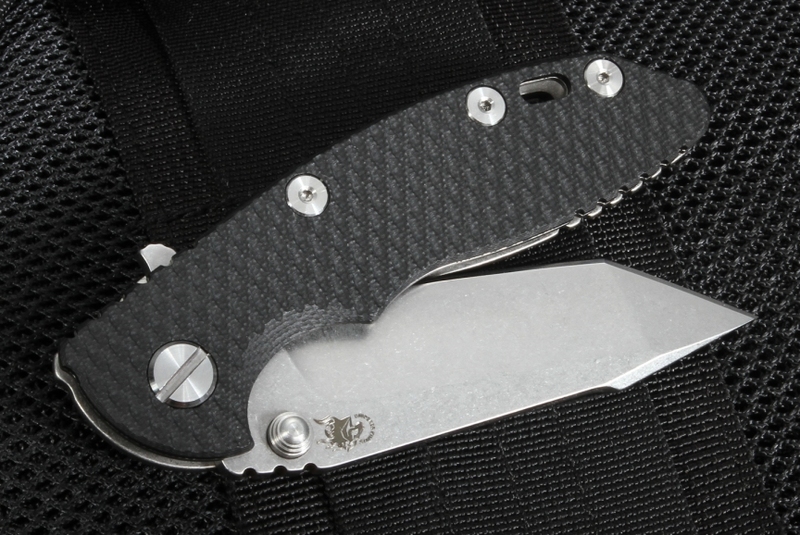 Great heavy use tactical XM-18 3" Harpoon folding knife from Rick Hinderer. Bought this one as a gift for a friend. Great knife. The Spanto blade is what helped me make the decision for him. 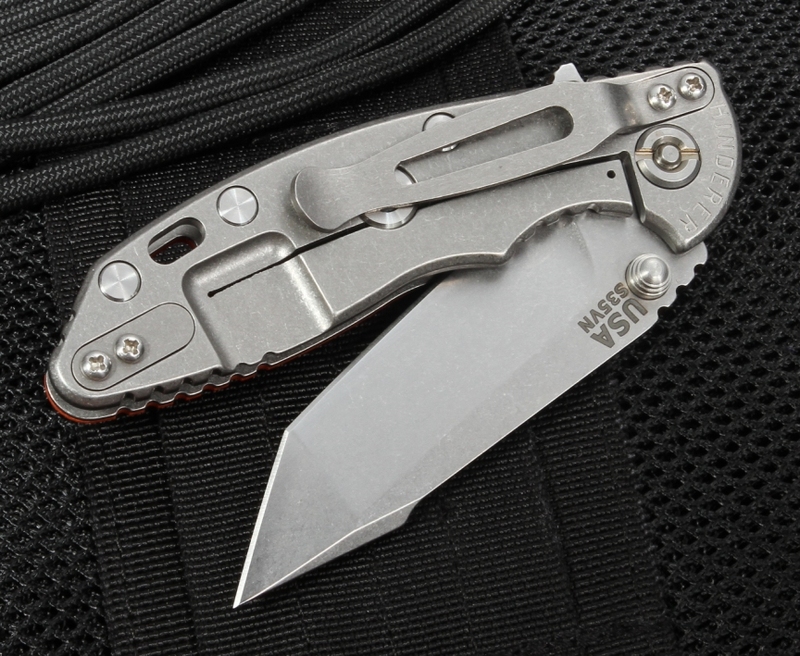 It's a tough, rugged blade that will definitely get use in the construction field. What an awesome and beautiful knife! The fit and finish are excellent and I really like the overall design. I know many people like a tip-up carry, but it's nice to have the option for tip-down (there are pros and cons to each, IMHO). 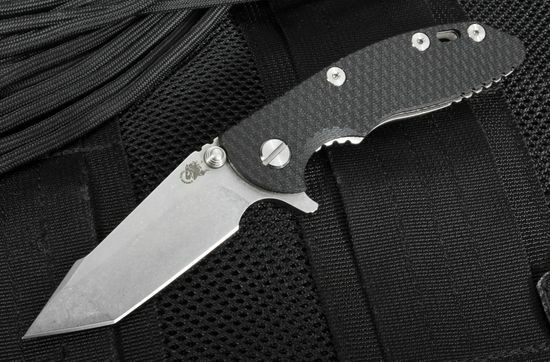 I also appreciate that the 3" size is somewhat less intimidating than, say, my Strider SnG, or Chris Reeve Large Sebenza. Both are excellent knives in their own right and fun to carry, but sometimes I get worried glances from co-workers or family members when use one of those larger knives in their presence, so I appreciate the somewhat more less intimidating appearance of this Hinderer while still being a usable size for most tasks. That being said, I definitely hope to add a 3.5" spanto to my collection as soon as I have the chance. My main caveat would be that the action is a little tight to easily "flip" and the detent is very strong, but I expect these to settle in with use. I also am compelled to mention, as always, that the service in general from everyone at Knife Art is exemplary. Thanks!